Enough music to drive you Madascagar. Ask any Art of Trance fan (after you find one after digging through the heap of David Guetta and Hardwell followers) what the most popular track he ever produced is, and "Madagascar" is likely to pop up from more than a few of them. It's become his signature tune, although the melody that people remember from Madagascar doesn't even come from Art of Trance, but by one of his remixes that has since usurped the throne. 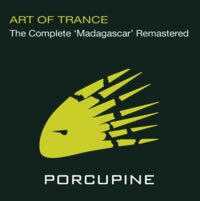 In 2010, all of the previous remixes were remastered to form "The Complete Madagascar". Interestingly, the package doesn't start with the original but with the Richard Durand Remix, which takes the "new" melody and gives it a more jungle feel with weird knocks (and later, other random percussion) in the background. It doesn't add much else into the mix, making this mix not really worth the listen. It also sounds overcompressed: the snares are too crunchy, making this sound like it's bitcrunched at 96kbps off an old Internet radio station or ripped off of Audiogalaxy (anyone get THAT reference?). Next up is the far more legendary Ferry Corsten Remix, which adopts his classic trance sound from the late 1990s that all of his productions followed at that point. Filled with a bubbly bassline and some reverbed angelic synths, Ferry Corsten drops the melody well into any trance set. It sounds a bit outdated now, but at the time, it was quite the banger. The Transa Remix is more straightforward trance, sounding closer to what you might experience today, with a deeper bassline and a far more trance-laden and mildly ambient take on Cygnus X's melody. Unfortunately, in adding his own dramatic melancholy pad tune underneath another, there's a clash of harmony here, and it is quite noticeable and disturbing even to a casual listener. This remix, in short, just doesn't work. Meanwhile, the Push Remix, courtesy of Push a.k.a. M.I.K.E. a.k.a. a thousand other names, really PUSHES the Cygnus X melody to the limit for a few minutes before injecting his own mid-way through. But it doesn't last long and really is easily forgettable as the other melody returns to take over. Push changes the harmony slightly, but it still works in his favour. Not a long new has been added to give this remix much of a kick, but for another trance perspective, this one might do the trick. If you want a little more speed to the original, perhaps the Domi-Nation Remix could do the trick. Filled with acid, the Cygnus X melody, and even some woeful female chants, this one has a faster and more urgent vibe while maintaining the spirit of Cygnus X's take on Madagascar. Consider this the 2.0 of that remix; there's not a lot new to report, but this one could definitely work a dancefloor a little harder. Also featured is the Kumara Remix, which, sad to say, offers absolutely nothing new. It's practically a carbon copy, save for a little blippy synth that plays throughout and a slightly different beat. This should have been rejected, as it barely qualifies as a "remix" of anything. Phil Crawf puts his hands into the mix with the naturally-titled Phil Crawf Remix, and it delivers a techy rendition of Madagascar that is quite welcome amongst this large amount of trance. Using the Cygnus X melody, Phil Crawf relies more on chugging tech bass to render this big tech-trance stomper. It's definitely a change and not something you'll hear in any of the other tracks. In fact, it's worth a listen just on the merit of being different alone. To close up, there's the Michael Woods Chill Out Remix, offering a variety of nature and other wobbly sounds over angelic pads as the Cygnus X melody comes in. It's ambient, it's relaxing, and once again, it's something different to round out the package. Also included are radio edits for the Richard Durand, Ferry Corsten, and Push remixes at the end if you want smaller doses of those. All in all, it's a pretty good remix package, hampered only by a couple of drab and uninspired inclusions. It's also a shame that most of these remixes failed to even examine the original source material, focusing on one early remix and basing their work off of that. I strongly recommend that you check out the Original Mix first before listening to the others, so you know where all the fuss began and so you're aware of what the REAL Madagascar sounds like.